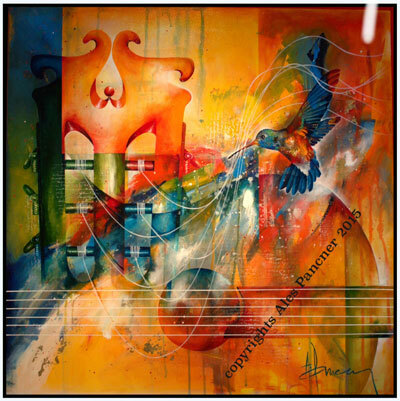 This beautiful piece entitled "Alergro" captures fast classical guitar music as well as fast vibration of guitar strings while incorporating fast vibration of Hummingbirds wings. These classical guitar oriented art works are created by Czech artist Ales Pancner. He is exclusively represented in United States by Strings By Mail for this classical guitar related artwork. We offer these three archival quality Limited Edition Giclees in either 20 x 20 or 12 x 12 inch format. Each painting is limited to only 100 signed, numbered and individually hand embellished pieces, making each one unique. They are double matted and protected by clear acid free sleeve ready to be framed or given as a special gift. Official Certificate of Authenticity with assigned Issue number and artist signature attached on the back. A perfect gift for any classical guitar lover! NOTE: ACTUAL PRINT SIZE IS 14" x 14" - WITH MAT IS 20" x 20"